I have been using Urban Decay's Lush Lash System for the past 6 weeks and I am SO excited to share the results because they are phenomenal! Urban Decay's Lush Lash System contains two products: a serum that applies at the base of your lashes, and a mask that you apply like mascara. Urban Decay claims that the system will give you 25% longer, thicker lashes in just 2 weeks, with 40% improvement in 4 weeks and 63% longer, thicker lashes in 6 weeks. I decided to try for six weeks to see the best results possible. Around the two week point, I started to notice that my lashes looked thicker and darker than normal, but I was unsure if they looked longer. It was around the four week mark that my lashes started to look longer and fuller, and now, at the end of six weeks, my lashes are very noticeably longer and thicker. The clear gel-like serum accelerates the growth of your lashes with peptides. Use the tiny brush to apply it at your lash line. It penetrates at the root and stimulates keratin to lengthen, thicken and fortify your lashes. Simply brush it on each night before bed. The conditioning mask applies with a wand and loads your lashes with growth peptides and high potency ingredients like Panthenol and Vitamin E. Your conditioned lashes can now resist loss and breakage from being too dry and brittle. I have been really impressed with the Lush Lash System, and judging by the favorable reviews at UrbanDecay.com, others have been too. I was fairly skeptical, since I have never had success with a lash lengthening system, but I am really happy with the results (even my lower lashes look longer!). The Lush Lash System retails for $42.00 and is available through UrbanDecay.com or at major retailers, such as Sephora and Ulta. Like all Urban Decay products, the Lush Lash System is never tested on animals, and it is also vegan! 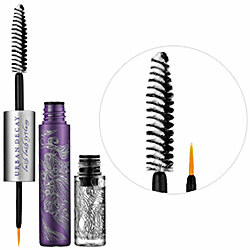 Learn more about the Lush Lash System at UrbanDecay.com. It would be redundant to ask why wants longer lashes (don't we all?) So instead, have you tried (or considered) the Lush Lash System before? Product provided for review purposes. All opinions are my own. I used The Lush Lash System most nights for 6 weeks; for all of the photos, I wore Urban Decay Cannonball Mascara. I am using the new Peter Thomas Roth system that is similar but has an amazing mascara with it that has already a cult following. I am a major test case since I am blond with clear, see though lashes and also went through cancer treatment 2 times with 4 rounds of chemo both times. I have really very few lashes left. But what I have, the PTR system is working well for me. beachgal, I always love reading your comments :) I had no idea that you are a cancer survivor; I hope you are doing well now. I have never heard of the PTR system, but I am so glad it is working so well for you! I was really impressed with this system because I have never seen my lashes so long! I even took it with me when I went camping and every time I looked in the mirror I was surprised how long my lashes looked (I would say this was around the 4 week point). Thanks for commenting, and I hope you are staying cool on these hot, hot August days! I got this one at Ulta and the girl there convinced me to try Cargo mascara/lash grower (I forget the name). I do LOVE how my lashes look with that mascara. At $35 (ouch) it was quite a splurge but it does give me amazing lashes and she says she used both (UD system and the Cargo mascara/system) and that her lashes had really grown. Monica, I can't wait to hear how the UD Lush Lash System works for you over the next few weeks! I know what you mean about missing the long lashes. I like using the UD growth creme on my lashes before mascara too, I discovered that this weekend; I layered it with mascara and my lashes looked amazing! Ill have to check out the cargo mascara, thanks for the tip! I just ordered the Lash Lush System. Hoping I have good news to report.